A liquid eyeliner with a flexible felt-tip precision brush for ultimate line control and color release. Achieve delicately thin or dramatically bold lines packed with rich pigment. Apply along lash line, from inner corner of eye tracing outward. Layer for a bolder look. What is Asha's Ink Liner? A liquid eyeliner with a flexible felt-tip precision brush for ultimate line control and color release. How does the Asha's Ink Liner work? The flexible felt-tip precision brush achieves delicate thin or dramatically bold lines packed with rich pigment. WHAT INGREDIENTS ARE IN Asha's Ink Liner? WHAT IS Asha's Ink Liner NET WEIGHT? TELL ME WHAT MAKES Asha's Ink Liner SO AMAZING? WHAT ARE THE BENEFITS OF Asha's Ink Liner? How much does Asha's Ink Liner cost? Where can I purchase Asha's Ink Liner? Is Asha's Ink Liner PV eligible? Yes. Asha's Ink Liner is PV eligible. 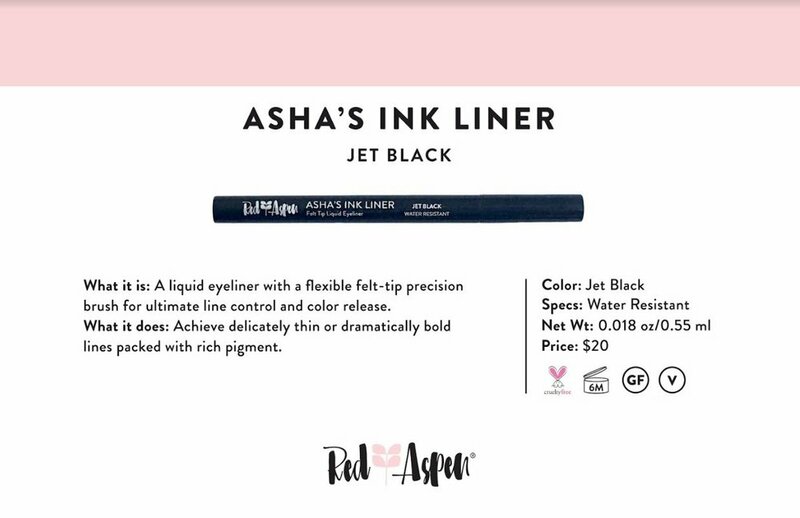 Can you add Asha's Ink Liner to your Loyalty Box? Yes. Asha's Ink Liner is available for both customers and Brand Ambassadors to add to their Loyalty Box.